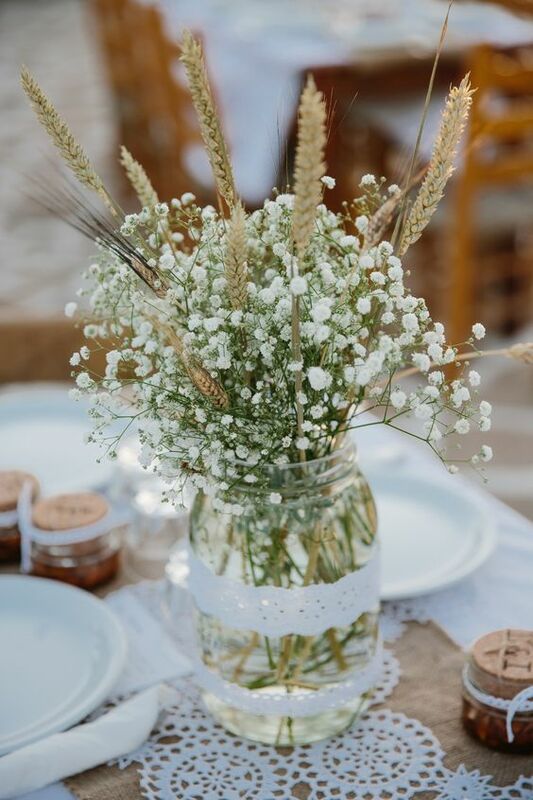 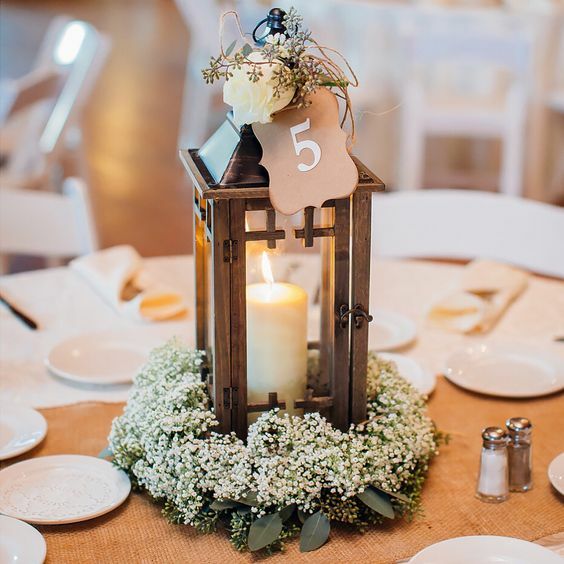 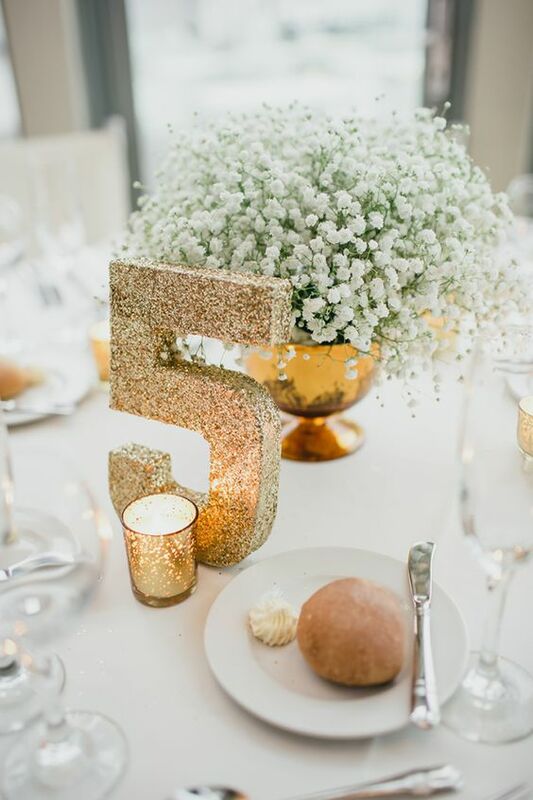 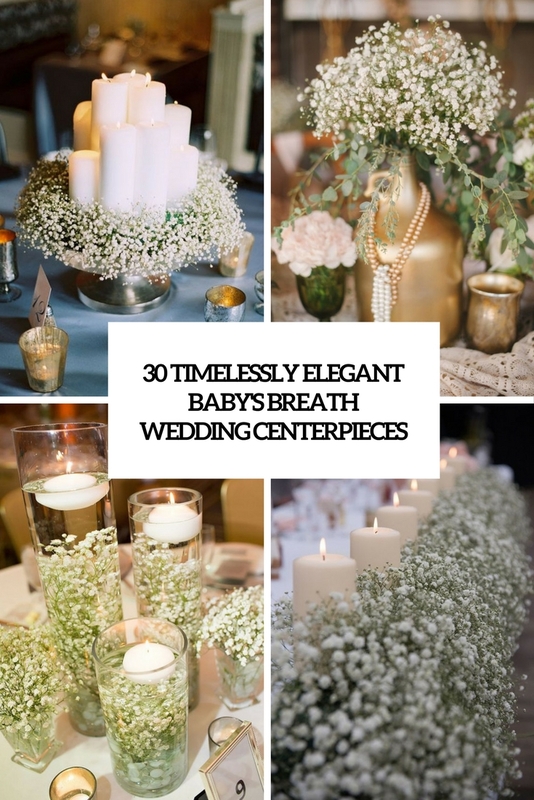 Baby’s breath is one of the most popular flowers used at weddings for several reasons: first, it’s very elegant and timeless, second, it’s very budget-friendly and third, it matches a lot of colorful schemes and wedding styles. 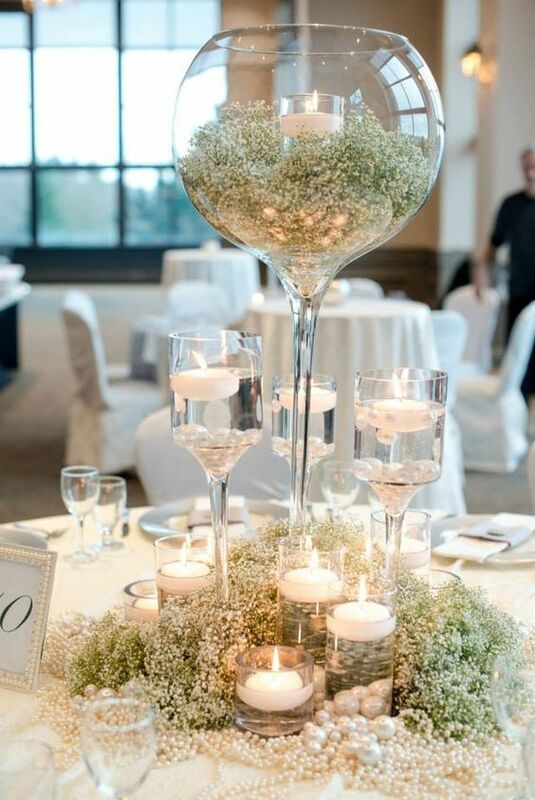 We’ve already shared some cool ideas to use it as your wedding, and today I’d like to be more precise and how you some amazing centerpieces to rock. 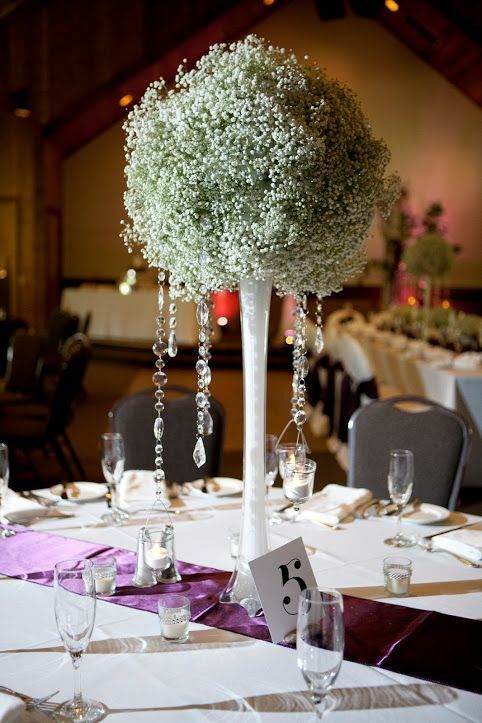 Most of them are pretty easy to repeat and you don’t need any florist or other professional to arrange them. 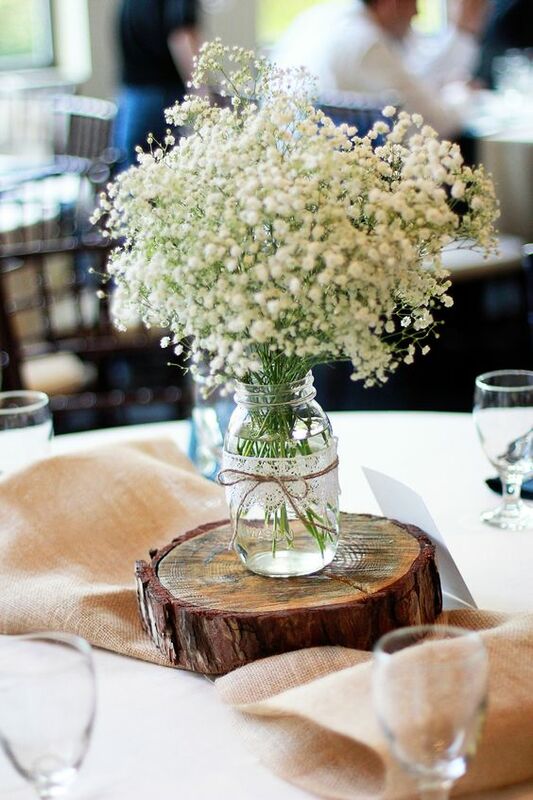 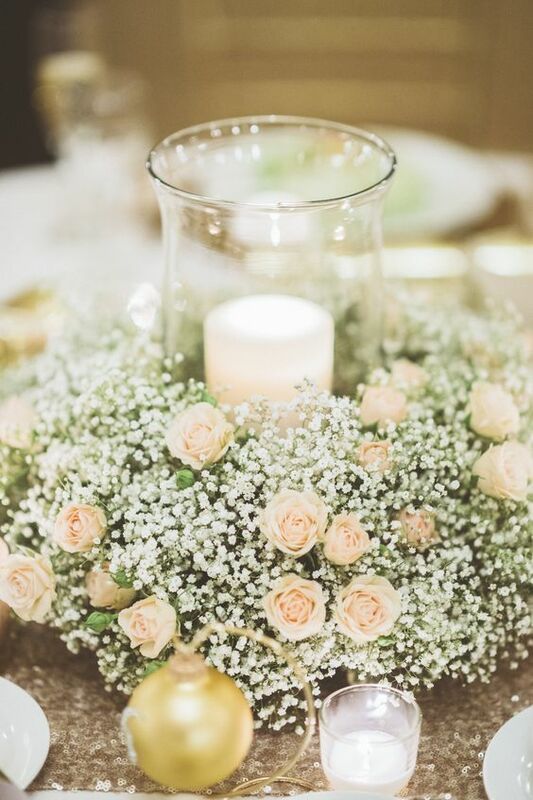 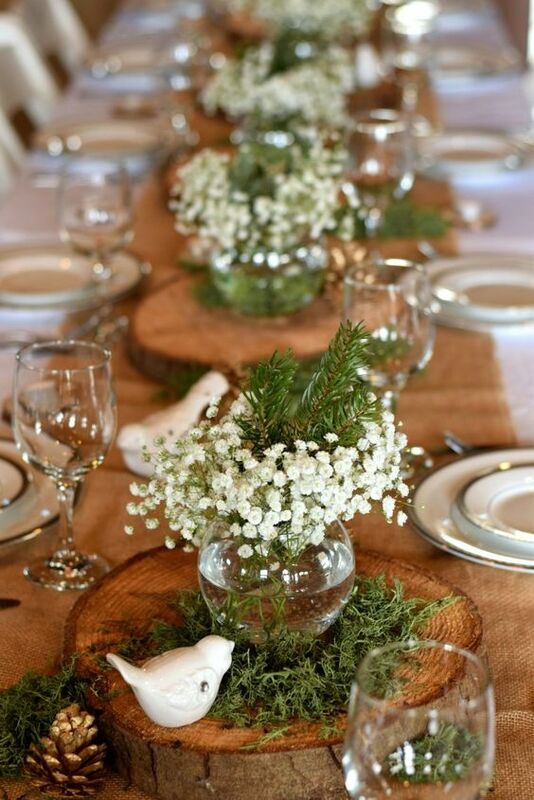 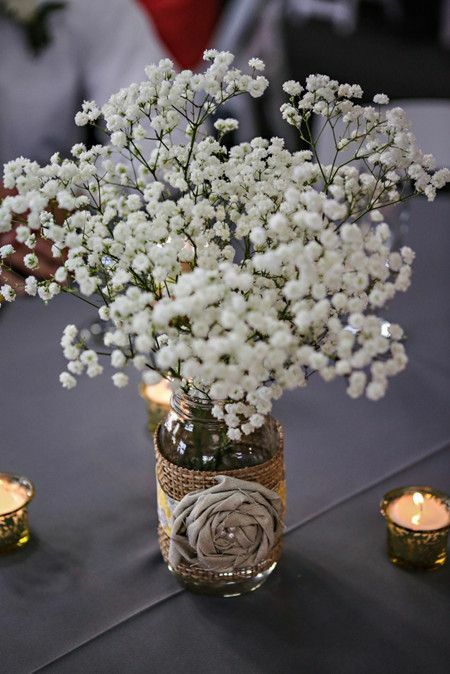 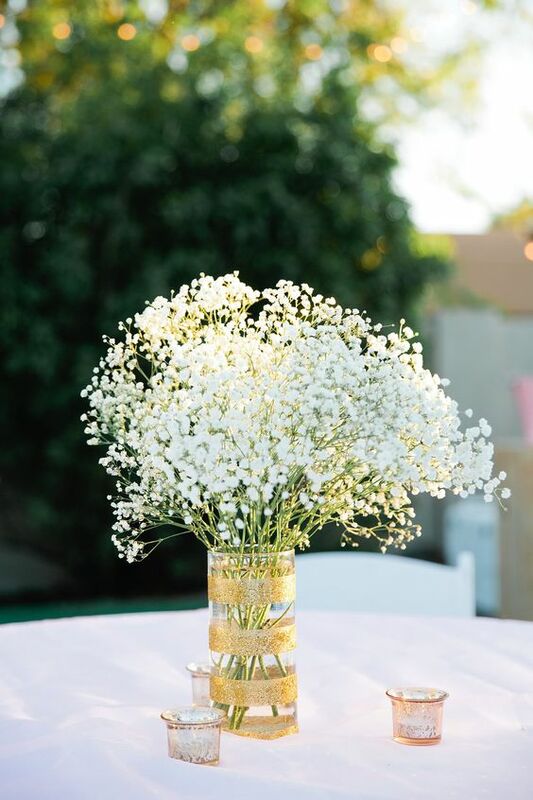 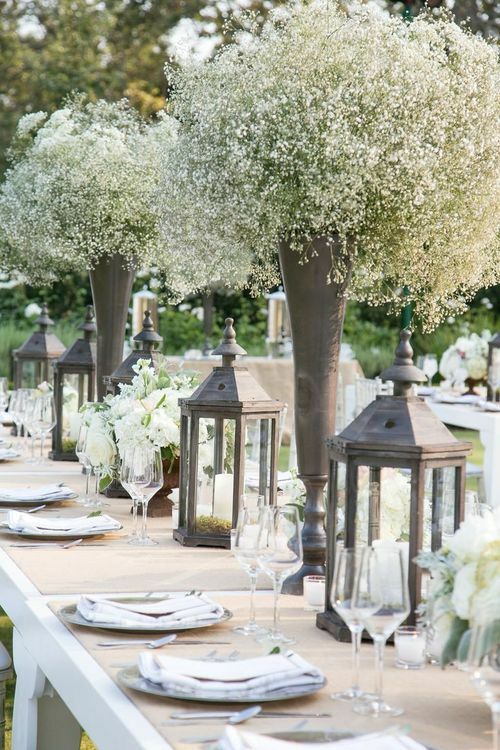 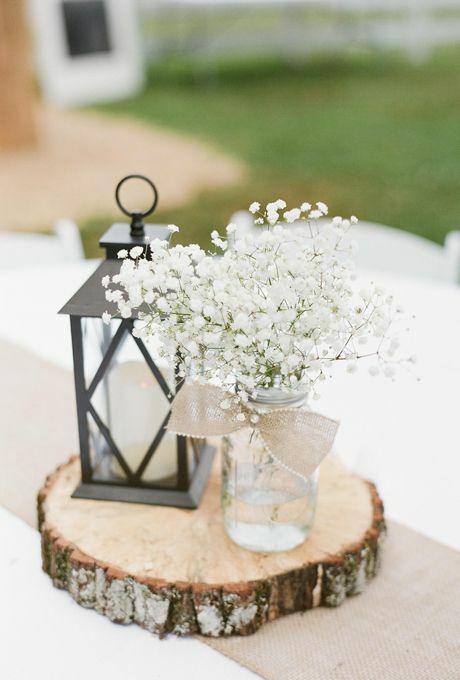 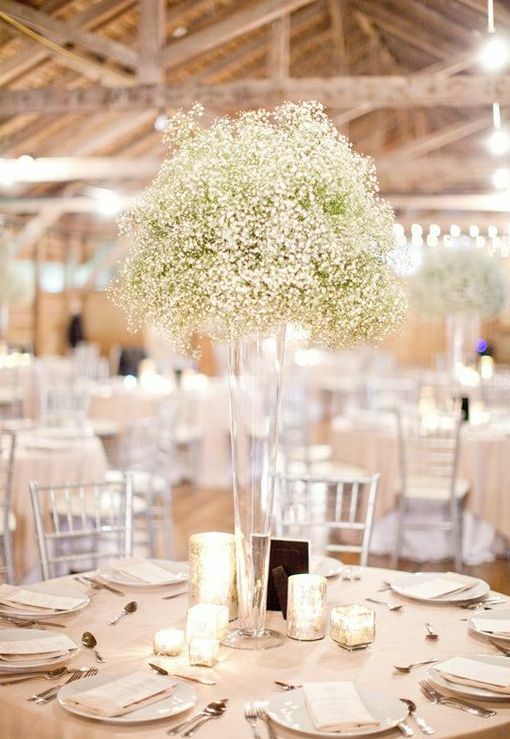 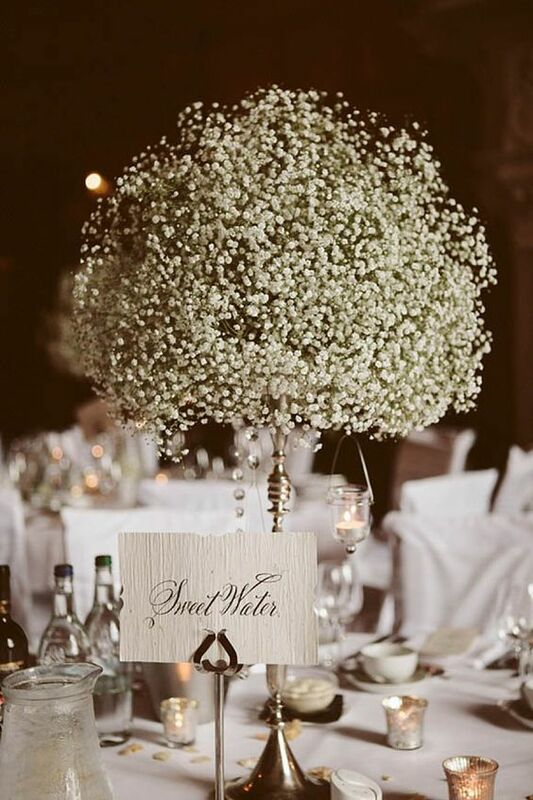 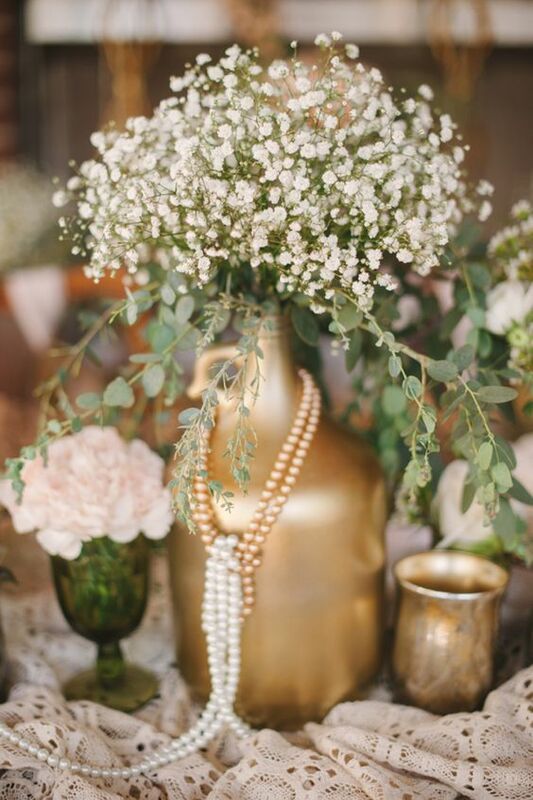 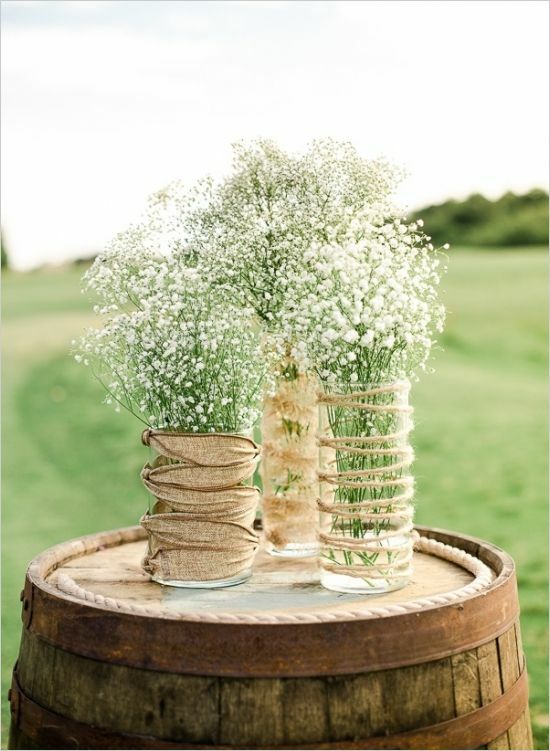 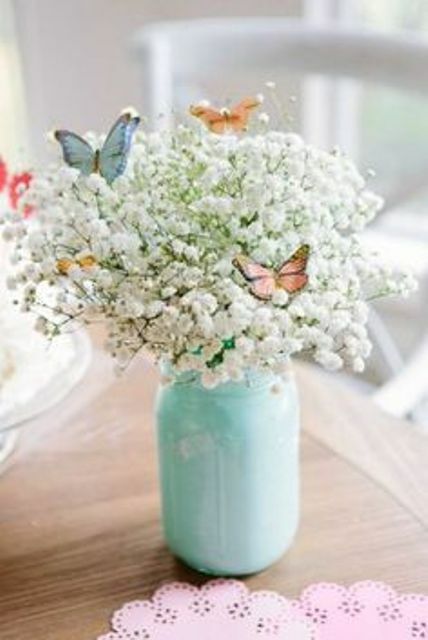 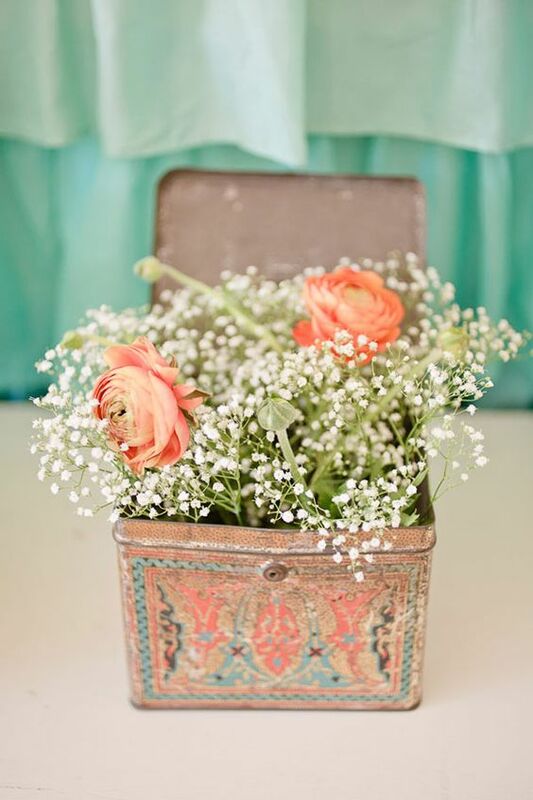 Baby’s breath is always elegant and timeless, whatever container or vase you choose, so stick to your wedding style. 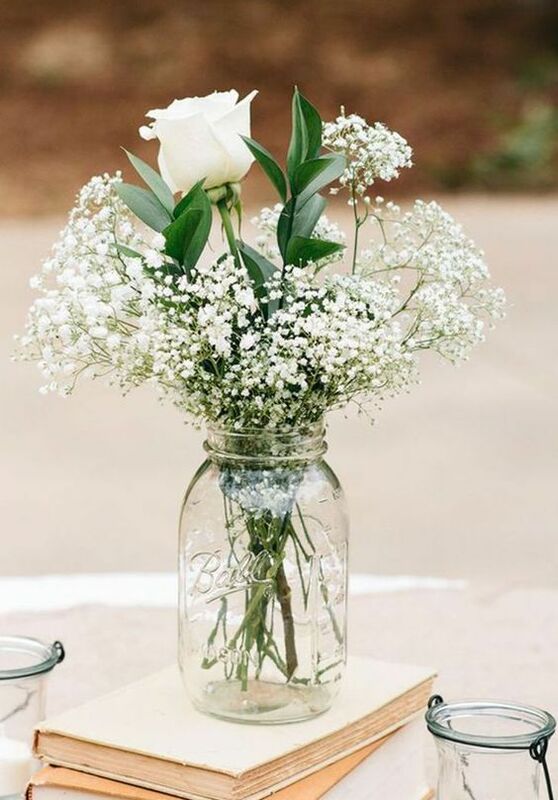 These can be mason jars wrapped with burlap and lace for a rustic or woodland wedding, gold painted jars for a glam feel, mercury glass vases for a romantic touch or a tin box of a vintage look. 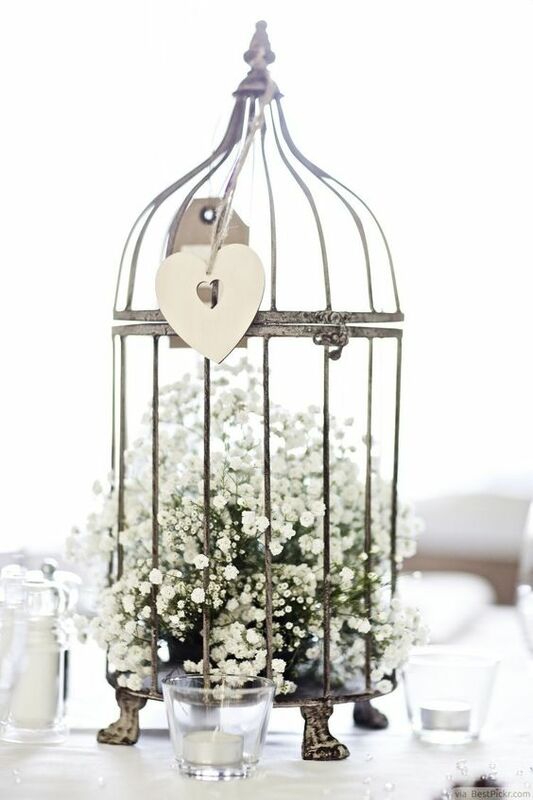 A vintage bird cage will make your table décor exquisite, while a galvanized bucket or a basket will make it cute and rustic. 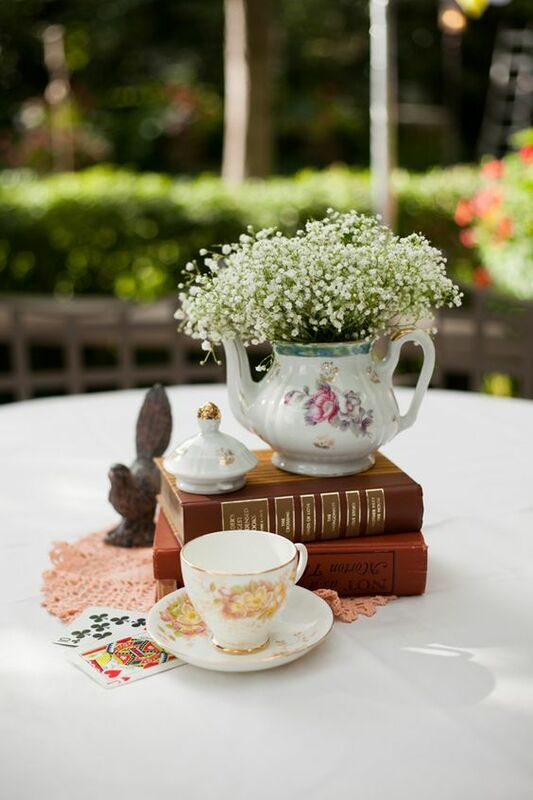 Vintage teacups and teapots are a great choice for a vintage-inspired wedding. 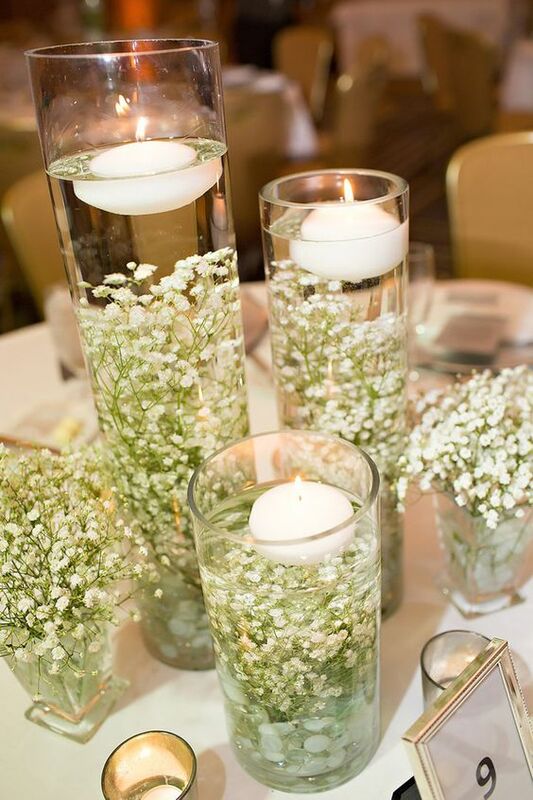 Glass vases and even aquariums with baby’s breath look ethereal, so try them for sure! 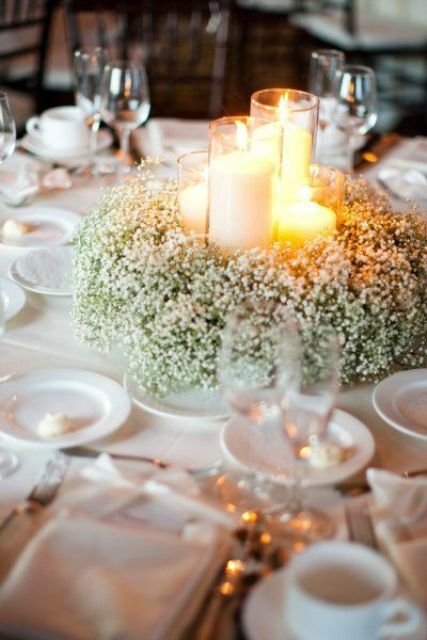 Add cool touches to your centerpiece to make it even more special. 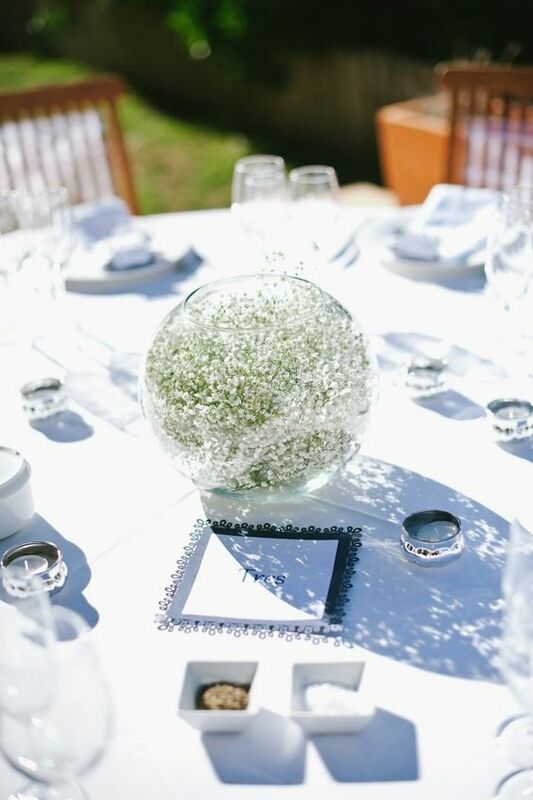 Baby’s breath can be arranged in balls and you can hang crystals to it. 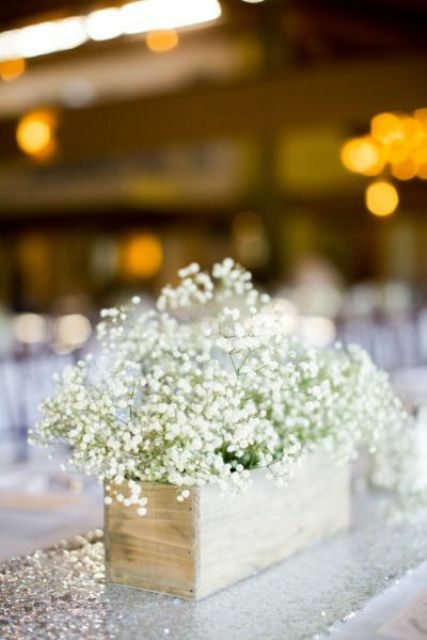 Baby’s breath can be easily combined with different blooms, for example, roses or ranunculus. 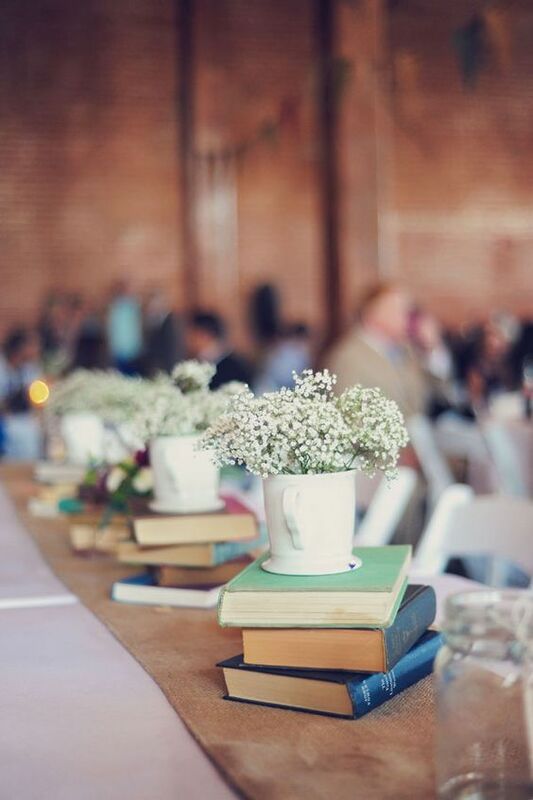 Create a beautiful composition with a wood slice or a stack of books, put a vase on it, add strands of pearls for a glam feel. 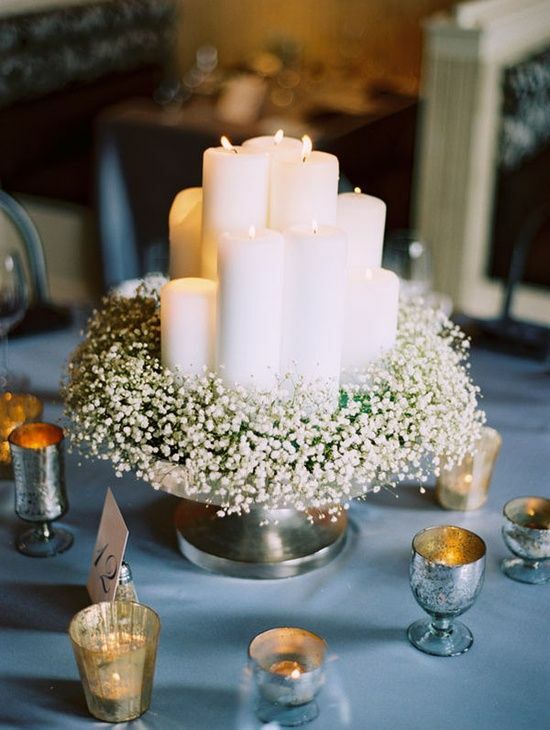 Candles will make your centerpiece amazing, cozy and cool, so you can surround it with candles or make the candles a centerpiece and surround it with baby’s breath. 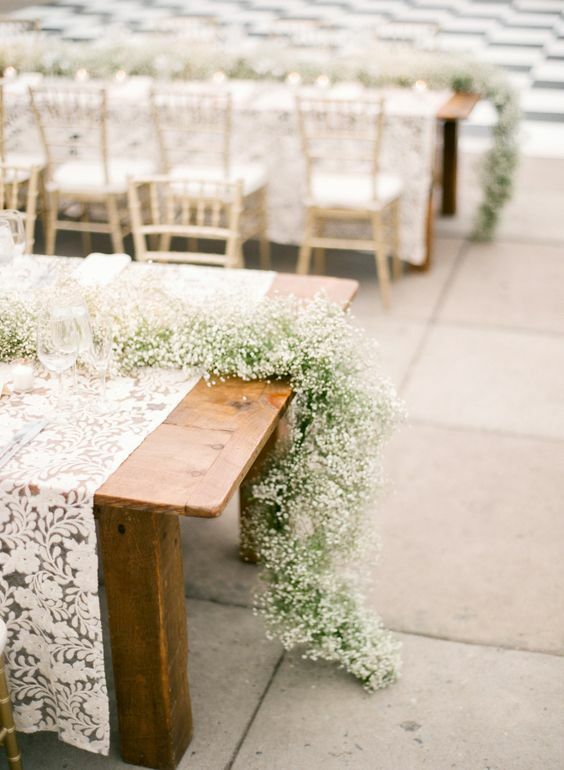 A garland is a popular thing for wedding décor, and it may be used on your tables instead of a usual centerpiece. 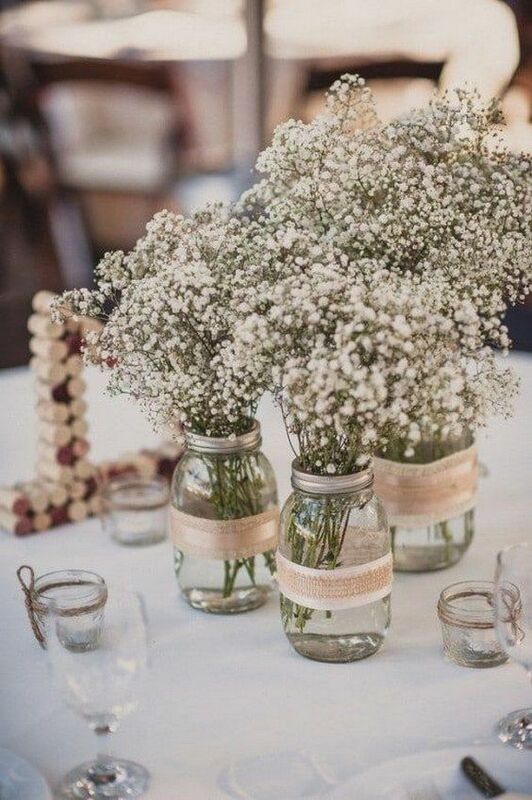 Make a cool baby’s breath garland and put it on the table to make it look beautiful and timeless, it’s much easier than arranging different centerpieces. 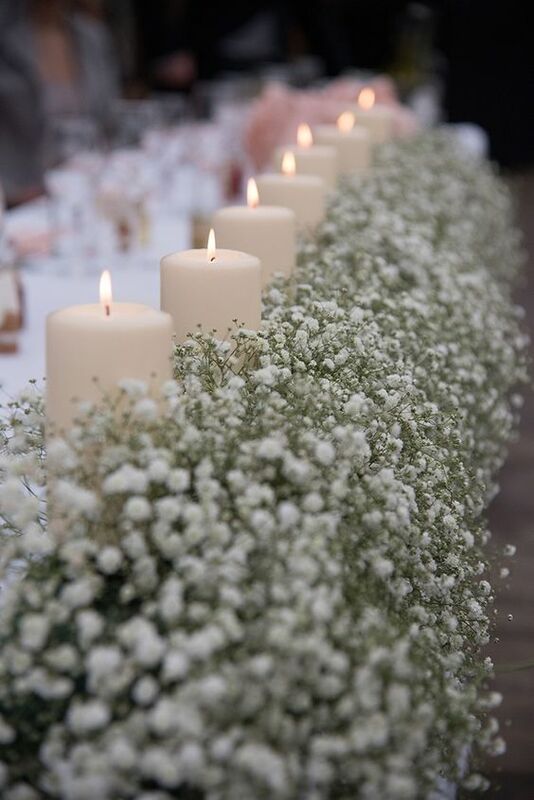 Line up the garland with candles in candle holders for safety and enjoy!